Isiah Thomas still has some old pairs tucked away at his house. The retired Detroit Pistons Hall of Famer hasn’t laced up the sneakers in what seems like forever. But they certainly remind him of the pinnacle of his playing days, and a bold chance he took with a footwear brand trying to make its mark in basketball. “Keepsakes,” said Thomas, now 57, of the kicks in his closet from the 1989-90 season. They’re not Converse, Nikes or Adidas. They’re Pumas. That’s right — Thomas, the leader of Detroit’s “Bad Boys” era and one of the NBA’s 50 Greatest Players of all time, was once endorsed by the German sportswear company. He rocked Puma’s basketball shoes on the court and on life-size cardboard cutouts. They’re also the shoes Thomas wore when he was named MVP of the 1990 NBA Finals after the Pistons beat the Portland Trail Blazers to claim back-to-back titles. “I won a lot of games in my Pumas,” Thomas said. “My fondest memories are winning a championship in them and pouring that champagne on my head. … I was killing ’em in those shoes.” Thomas’ time with Puma is part of an almost forgotten history: storied yet short-lived, the partnership lasting just one season. @PumaHoops has a strong social media presence, its own private jet and a fresh new on-court sneaker, the Clyde Court Disrupt, inspired by true Puma icon Walt “Clyde” Frazier, who now has a lifetime deal with the company he joined in the early 1970s. More players are wearing Pumas on the court than at any other time in NBA history. They’ve joined the Puma basketball family, which has a deeper and more tantalizing history than most would imagine. As Converse, Nike, Adidas and Reebok starred on court from the 1970s to the early 2000s, Puma placed its products on the feet of Hall of Famers and world champions, even once persuading a scoring titleholder to come on board. Pumas have graced the hardwood of high school showcases, college games and NBA Slam Dunk Contests. Deals were inked with everyone from the NBA’s tallest player ever to a high-flying phenom from the University of North Carolina who the company hoped would change its basketball fate. Puma tried again and again to thrive with some of the biggest names in all of hoops. So how come it never worked? 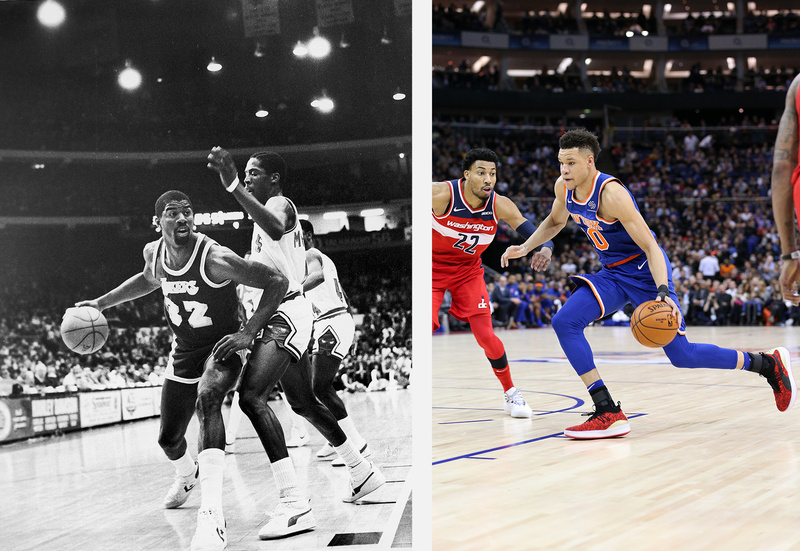 It all started in 1973, when Frazier became not only Puma’s first signature athlete but also the first player in basketball history to get his own sneaker. 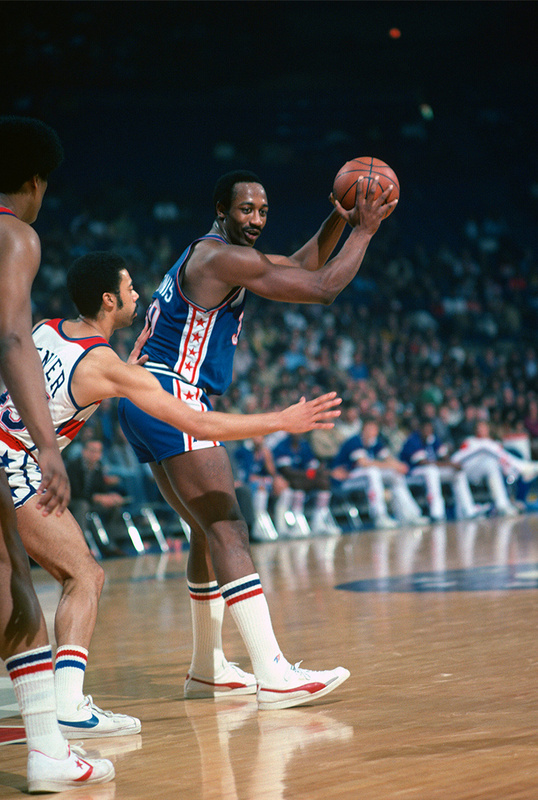 At the time, Frazier had a championship ring and was after another, averaging 21.1 points, 5.9 assists and a career-high 7.9 rebounds a game during the ’72-’73 season as the All-Star point guard for the New York Knicks. “For me, it was a big ego trip,” the Atlanta-born Frazier said in 2015, “because I was the only guy in any sport that had a shoe named after him.” Yet, even before Frazier dazzled in his own sneakers at Madison Square Garden, cats on asphalt courts throughout New York City swagged Pumas. Frazier catapulted Puma onto the world’s biggest basketball stages indoors, wearing Clydes when he and Willis Reed led the New York Knicks to a championship over Wilt Chamberlain, Jerry West and the Los Angeles Lakers in the 1973 NBA Finals. The Clyde ultimately emerged as one of the most influential sneakers of all time — a shoe that, after being embraced by hip-hop culture, transcended the sport of basketball. It was the epitome of style and embodiment of cool. Everyone, from ballplayers to break dancers, wanted to wear Puma — and Frazier was a huge reason why. Soon after the Clyde’s 1973 debut, Puma signed George McGinnis, a back-to-back American Basketball Association (ABA) champion with the Indiana Pacers and the MVP of the league’s 1973 playoffs. In the first game that McGinnis, a 2017 Hall of Fame inductee, wore Pumas, the sneakers couldn’t handle the 6-foot-8-inch, 235-pound big man. On his second touch of the night, he ripped right through the top of one. 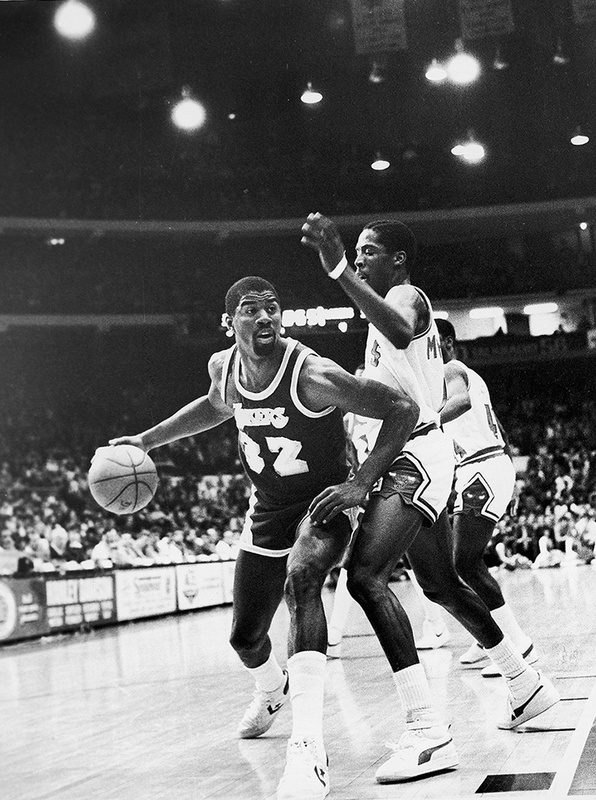 “I’m very hard on shoes,” McGinnis later told the Indianapolis News. “When I cut, they rip.” He finished the game with Puma on one foot and Converse on the other. The Puma roster is loaded. Five of the first 16 picks in the 2018 NBA draft, including the top two selections. “Should you wear Puma?” Bobby Jones, an eight-time NBA All-Defensive first-team selection with the Denver Nuggets and Philadelphia 76ers, posed in a first-person print ad from 1978, promoting the Puma Super Basket shoe. “All I can give you is my opinion.” Yet by 1979, Jones had switched to Adidas. In 1980, Frazier retired. Coming off All-Star MVP honors and an NBA title with the Boston Celtics in 1981, Nate “Tiny” Archibald became Puma’s next big endorsee. Like Jones, however, Archibald lasted only one season with the brand. Spoiler: Supershort deals with players would continuously haunt Puma’s journey through basketball for decades. But it’s a trend that briefly changed in the mid-1980s, when the brand began courting star players such as Nuggets small forward Alex English. During the 1982-83 NBA season, no one could put the ball in the basket quite like the slender 6-foot-7 English, who made all 82 regular-season starts while posting an average of 28.4 points a game to win the league’s scoring title. English’s proficiency caught the attention of Puma, which lured him away from a previous shoe deal with Pony. The same year English began wearing Pumas, the Houston Rockets selected Ralph Sampson with the No. 1 pick in the 1983 NBA draft. 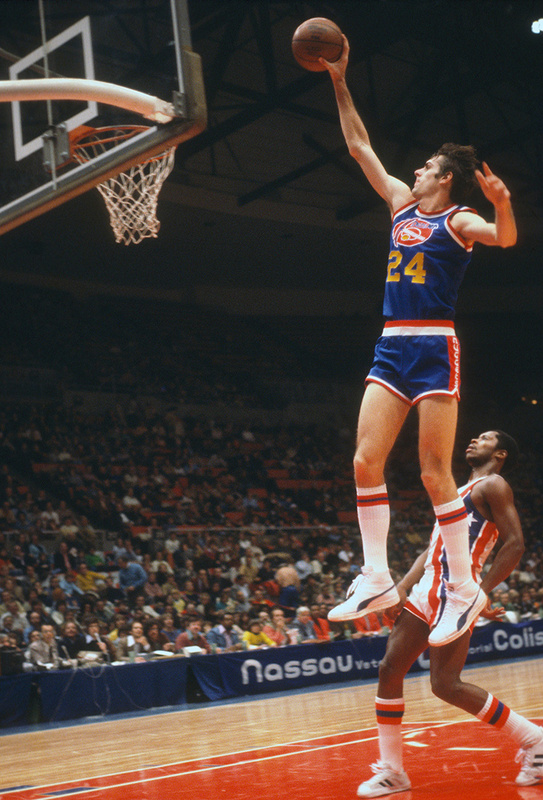 The 7-foot-4 Sampson had a history of wearing PRO-Keds in both high school and at the University of Virginia. Yet, as Sampson recalled during a discussion at the Naismith Memorial Basketball Hall of Fame, which he entered in 2012, PRO-Keds went on a hiatus shortly into his first season, halting the production of basketball sneakers. Puma scooped up Sampson, making him the company’s highest-profile basketball signing since Frazier. But there was one problem: Puma didn’t manufacture shoes in his gargantuan size 17. So the brand had to produce prototypes, which Sampson wore for most of his rookie year, including in the inaugural NBA Slam Dunk Contest in 1984. Sampson’s exclusive prototypes, some game-worn versions of which have sold at auction over the years, turned into pairs of his own sneakers that Puma then cranked out tirelessly. One ad from the mid-’80s promoted the release of “seven new Ralph Sampson signature shoes from Puma” — for real, seven at once. And, similar to Frazier, the Rockets center soon got a shoe named after him: the Puma Ralph Sampson. Sampson’s contract with Puma paid him approximately $400,000 from 1984 to 1989. “Ralph received a megadeal,” said Petrick. “It was the first time a player got a significant check for an endorsement.” After Sampson, a 21-year-old named Michael Jordan, the third overall pick in the 1984 NBA draft out of the University of North Carolina, signed a contract with Nike worth $500,000 annually for five years. During the ’84-’85 season, Wes Matthews started 38 games at point guard for the Chicago Bulls as the backcourt mate of the young M.J., who debuted the iconic Air Jordan 1. On Matthews’ feet: the Puma Sky LX. “I had some of my best games when I played in my Pumas with Michael Jordan,” Matthews said. “I took pride in my Pumas. I made sure they were clean every day. I made sure they gave me a couple extra pairs that I’d take on the road in case they got scuffed up or tore. … I felt like, OK, I’m wearing one of the baddest shoes in America.” And he wasn’t the only one. 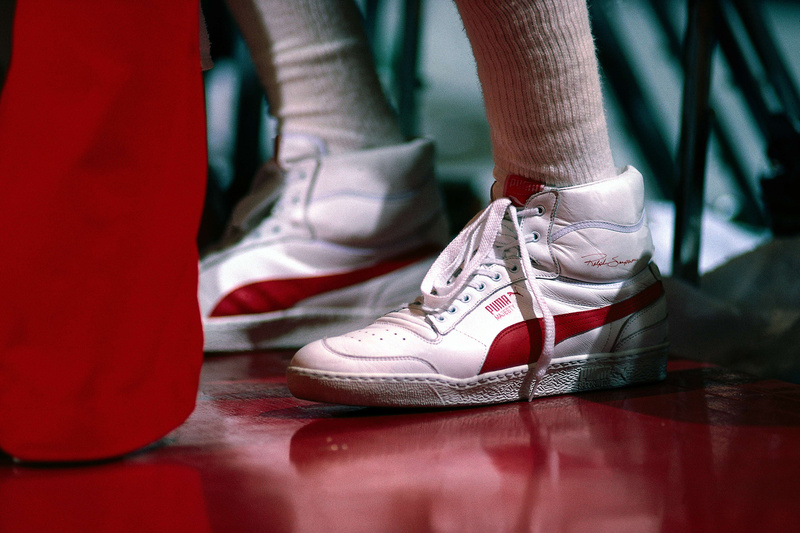 The 7-foot-7-inch Manute Bol, who holds the distinction (along with Gheorghe Muresan) of being the tallest player in NBA history, wore Pumas briefly in 1985. The brand also served as the official shoe supplier of the marquee McDonald’s All American Game in 1986 and became the footwear sponsor of college teams across the country, including Boston College, Cleveland State, DePaul, UCLA, Villanova and Wake Forest. Puma also added Cummings’ Bucks teammate Paul Pressey (who wore Pumas in the 1986 dunk contest), Lakers power forward A.C. Green and New Jersey Nets power forward Buck Williams to the mix. 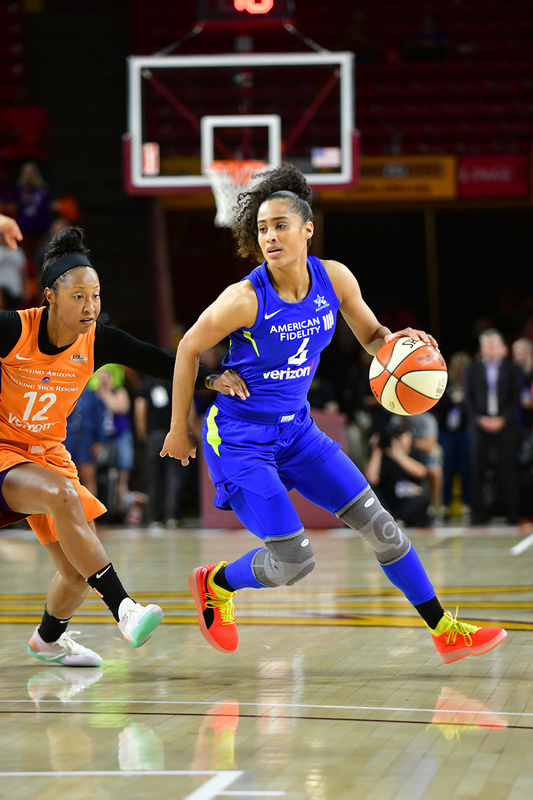 “Puma at the time was aggressive and ahead of the curve,” Petrick said, “for what would come later, and what Nike would ultimately dominate — sports marketing.” Puma basketball was diversifying. Yet, according to a worldwide research company’s report included in a July 1986 story from the Chicago Tribune, the brand earned only 5.6 percent of the basketball sneaker market in the fourth quarter of 1985, compared with Nike, which checked in at 46.3 percent, and Converse at 17.4. “Nike and Converse were the big boys on the block,” recalled Isiah Thomas, a Converse endorsee from 1981 to 1989. “No one else was really able to break through.” Whether due to the strength of competitors, durability problems with shoes, trial-and-error product design, or a combination of them all, Puma’s 1980s resurgence in basketball eventually lost steam. As the decade drew to a close, the brand’s athletes began making moves. English left for ASICS, and Matthews turned a brief sneaker free agency into a deal with Converse. Pressey only stuck around for a season, and Green decided to roll with Nike. Buck Williams, who was contacted for this story, didn’t recall endorsing Puma at all. 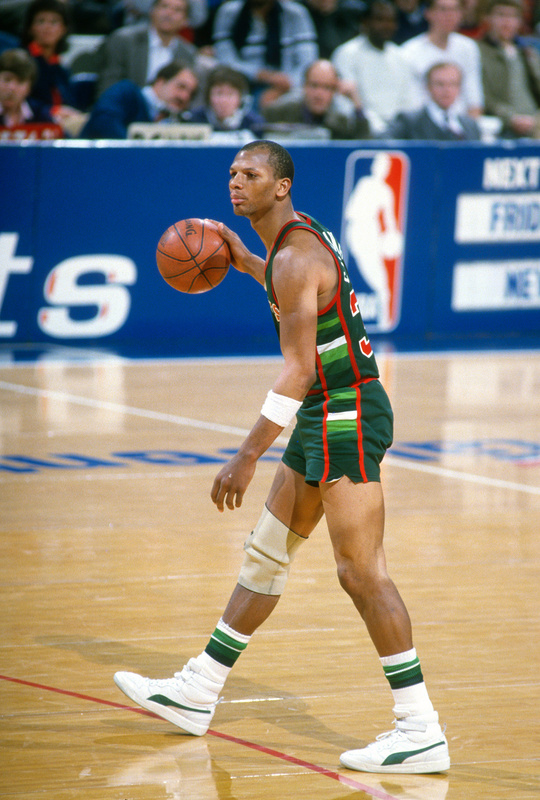 Only Cummings remained with the brand in basketball by 1989, when he wore Pumas in the All-Star Game. Later that year, Thomas ended his eight-year partnership with Converse to take a chance with Puma for the ’89-’90 season. Thomas led campaigns for Puma’s Stealth and Stalker silhouettes, as the brand prepared to give him the signature treatment. The 6-foot-1-inch Thomas wanted to take the court in low-cut sneakers that would complement his speed and playing style better than the bulky Converse high-tops. Puma cooked up the Palace Guard (which debuted a year after the opening of the Palace at Auburn Hills) for the feet of Detroit’s starting point guard. It was a perfect combination of design and storytelling. The shoes (a retro edition of which you can still find on Puma’s New Zealand website) were designed in red, white and blue, like Pistons uniforms, and with Thomas’ signature stitched on each tongue. They played a part in some of his biggest moments, from the 1990 All-Star Game to the NBA Finals months later. But Thomas only wore them for less than a year. Cummings, the last man standing, made the jump to Nike in 1990. By then, it was all about the Swoosh when it came to sneakers, while Jordan, the player dubbed His Airness, dominated the conversation in the NBA. Historic brands such as Converse and Puma suddenly phased out performance basketball sneakers. Ceballos donned the Disc Weapons during his unsuccessful title defense in the 1993 dunk contest and even incorporated the shoe into the performance. Before the start of the ’93-’94 season, the Suns competed in a tournament in Munich, where the team marveled at the sight of its backup forward on a massive billboard towering over part of the city. Back in the U.S. on 94 feet of hardwood, Ceballos took pride in being a nightly Puma spokesman. The sneakers gained some traction, but no one seemed to be able to get their hands on them. “Everybody was like, ‘Where do I find those? Where do I get those?’ ” Ceballos said. “It got to a point where they weren’t selling them in the States. They might have been selling them overseas? … I don’t know.” By the spring of 1993, the entire company actually found itself on the brink of bankruptcy, “struggling under eight years of losses, $250 million in debt and a warehouse filled with 1.5 million pairs of cheap $10 sneakers,” as The New York Times reported a decade later. “The early ’90s were when we were at our absolute worst,” Petrick said. “That was when the company just fell apart.” In the summer of 1994, Ceballos returned to Nike — another Puma athlete gone, just like that. Puma anointed the 6-foot-6-inch, long-armed leaper from Jordan’s alma mater as yet another savior. Two months after the Golden State Warriors selected Carter No. 5 overall in the 1998 NBA draft (a pick traded to the Toronto Raptors in exchange for his UNC teammate, Antawn Jamison), the brand finalized a 10-year, $50 million deal with the 21-year-old rookie. He became the only player at the time, and first in almost five years, to wear Pumas in the NBA. Carter joined New Orleans Saints running back Ricky Williams, world welterweight champion Oscar De La Hoya and then-16-year-old tennis prodigy Serena Williams to form a group of promising athletes representing Puma across multiple sports. “I am pleased to have the opportunity to join the Puma team and be a part of the company’s exciting return to basketball,” Carter said in an August 1998 press release. It wasn’t just his basketball prowess and sky-high ceiling that impressed the brand. The impact Carter, a goodwill ambassador for the Big Brothers Big Sisters of America, could have off the court was undeniable. Puma had a gem. Carter breathed life into Toronto basketball and emerged into an eight-time NBA All-Star. He put on the greatest show in Slam Dunk Contest history, helped propel Team USA to gold at the 2000 Olympic Games and has remained in the league for 21 seasons — the last of which he’s now spending at age 42 with the Atlanta Hawks. Yet Carter achieved all of these career milestones without Puma. Their anticipated decadelong union lasted just 16 months. Because of a nearly eight-month NBA lockout during his rookie year, Carter didn’t rock Pumas in an NBA game until late January 1999. He averaged 18.3 points and 5.7 rebounds a night wearing the Puma Cell Origin before being named the 1999 NBA Rookie of the Year. At the start of his second season, he appeared in a Puma ad with the tagline, “INTRODUCING Vince Carter’s shoe for the fall NBA season.” It promoted the Puma Cell VI, which he wore as the brand finalized his first official signature sneaker, dubbed the Puma Vinsanity after the nickname given to him by a play-by-play announcer on the call of one of his rookie year dunks. The Cell VI became “the top-selling shoe Puma ever had,” said longtime brand executive Jay Piccola in the 2017 documentary The Carter Effect. It blew up because folks thought (and still think) it was Carter’s debut signature model. While awaiting the drop of the Vinsanity, he turned into a walking advertisement for the Cell VI. In the summer of 1999, Carter made a surprise appearance at a Rucker Park pickup game that was moved indoors due to a severe thunderstorm. He pulled up with a wave cap on his head and Cell VIs on his feet before throwing down a windmill alley-oop that sent the 100-degree gym, jam-packed with 2,000-plus people (including Jay-Z), into a frenzy. Carter posed in the shoes during a photo shoot with his cousin and Raptors teammate Tracy McGrady for a five-page story in Sports Illustrated. 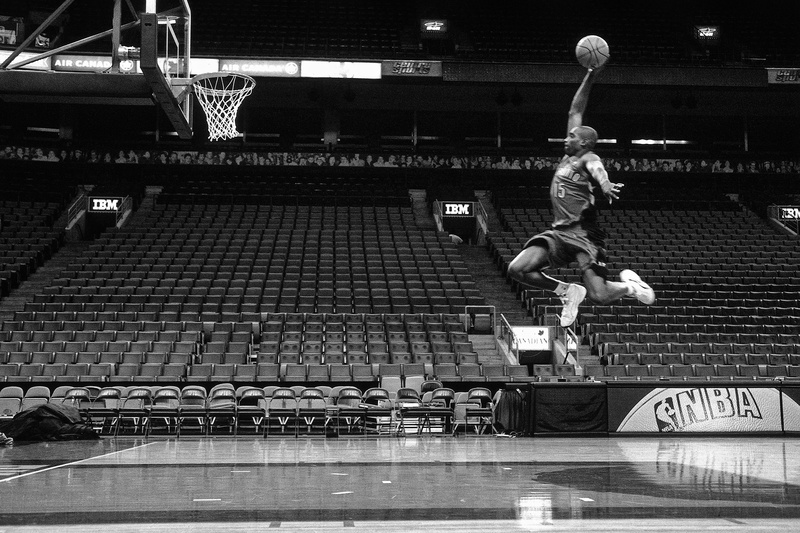 The same day the issue hit newsstands, on Nov. 1, 1999, another photo shoot took place at an empty Air Canada Centre. In the Cell VIs , Carter put on a clinic of jaw-dropping dunks — jumping from the free throw line, cocking the ball back and floating midair. Yet in a matchup between the Raptors and 76ers on Nov. 14, 1999, he broke out a white and black version of the Vinsanity. A week later, he was photographed in the Vinsanities again, this time while facing the Lakers under the lights at Staples Center. The game marked one of the last times he played in the first signature shoe of his career. The company went to arbitration with the Raptors star and reached a settlement that required him to pay Puma approximately $13.5 million in damages for breach of contract (plus an additional $1 million in lawyer fees). Carter earned about $36.5 million in the 471 days he spent with Puma. In April 2000, USA Today reported that Carter cited Pumas as hurting his feet as a reason for leaving. According to Ad Age, “Puma reportedly didn’t make good on its promise to introduce a new shoe line … or spend a certain level of advertising on Mr. Carter.” He’d grown frustrated at how slowly the brand approached marketing the Vinsanity, which was originally supposed to drop before the start of the ’99-’00 season. There’s little record of the release of the Vinsanity, save the occasional vintage pairs that pop up every now and then online. Digital versions of the shoe were rendered into NBA Live 2000. There’s also a lone print ad, and a commercial that teased the Vinsanity as “Vince Carter’s game shoe for the spring season.” In February 2000, he was named a starter for the NBA All-Star Game in Oakland, California, as well as a participant in the weekend’s dunk contest. Carter, a sneaker free agent, won in epic fashion wearing the AND1 Tai Chi — not the Vinsanity, as Puma had previously envisioned. By August 2000, Carter signed with Nike. “It was the perfect opportunity … it made sense,” Carter recently told The Undefeated, while declining to speak on his time with Puma. Almost 20 years later, one detail surrounding Carter’s Puma legacy has been frequently misreported. Carter wasn’t the the last player before the 2018 relaunch to wear Pumas in the NBA. Kenny Anderson, Chucky Atkins, Sam Perkins and John Wallace all wore them from 1999 to 2001. 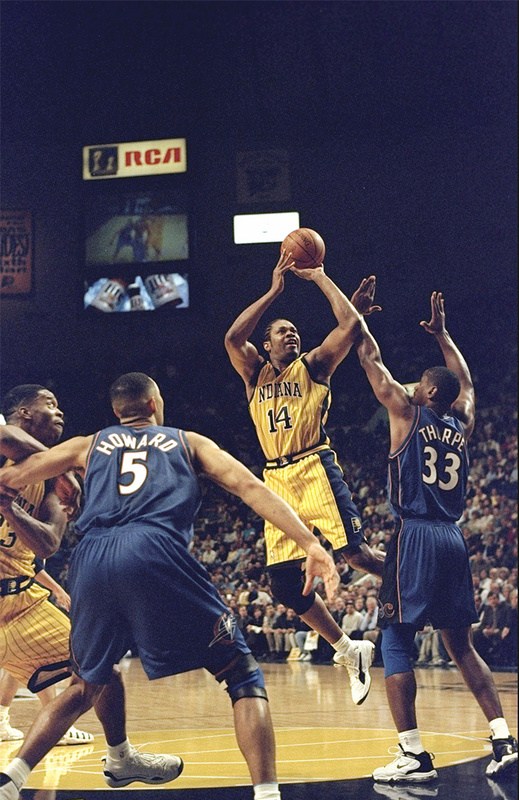 Perkins actually wore the Cell Origin on May 2, 2001, while playing for the Pacers in the final game of his 17-year NBA career. 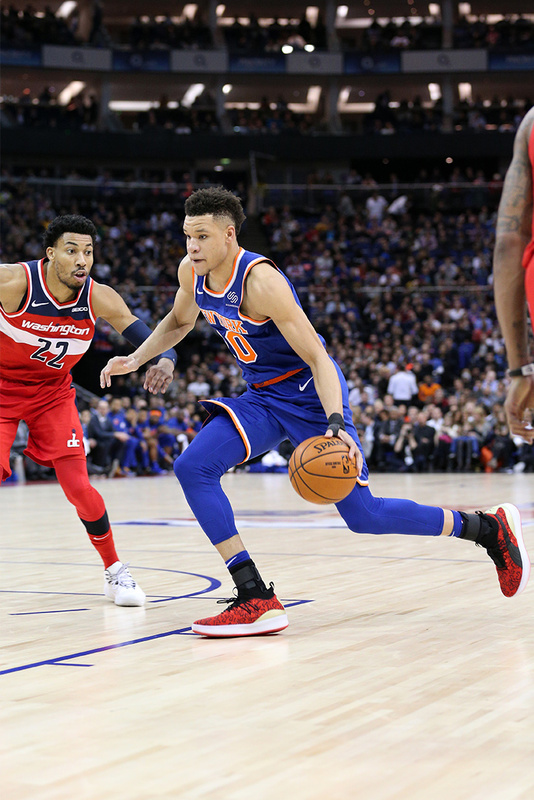 The core of the brand’s current athletes — Ayton, Bagley, Knox, Porter Jr. and Smith — are all under the age of 21. Yet, days before the Oct. 11 release of the Clyde Court Disrupt, the elder Matthews texted his son again with news of Puma’s latest signing — another early-30s shooting guard, also in his 10th year in the league. Then the brand found a “perfect fit” in the 28-year-old Boogie Cousins, who returned to playing in mid-January after being sidelined for almost a year with a ruptured Achilles tendon. He’s already debuted the Puma Uproar — a new model for the second half of the NBA season, which is set to drop during All-Star Weekend in mid-February. Of Puma basketball’s current athletes, Cousins is the only true superstar. But the future seems to rely heavily on those five rookies. Puma basketball is back — again.